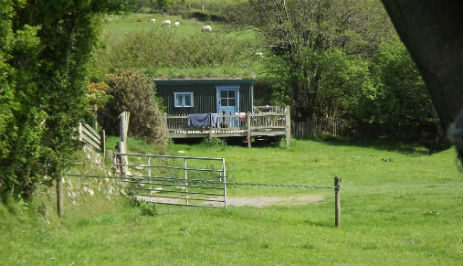 Westland Farm is a small working farm in Devon offering Glamping on the edge of the Exmoor National Park, near to the North Devon Coast. Our aim here is to enable you to wind down and reconnect with nature. At Westland Farm we hope to provide a unique opportunity to escape the stress and strains of everyday life. We look forward to helping you relax and refresh during your holiday in the stunning, unspoilt surroundings of the North Devon countryside. Set amidst the lush, rolling countryside of North Devon, on the edge of Exmoor National Park and close to some truly spectacular beaches, ancient market towns and country pubs, Westland Farm is a little piece of heaven we wish to share with you. Stay in our romantic Mongolian yurt, our comfortable farmhouse or our home built, and utterly charming, Shepherd’s Hut or larger Drovers Hut. You can even bring your own tent, or caravan, and camp in one of our fields. Whatever you decide, you’ll enjoy the same sense of tranquility and blissful back-to-nature simplicity. 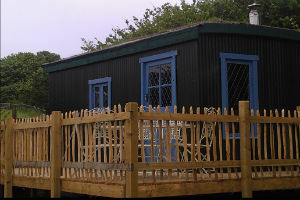 The Glamping set close to a babbling brook is a great place for children to build dams or play pooh sticks. There are farm animals to meet and, in lambing season, lambs to feed, several people have been lucky enough to see lambs being born. You can toast marshmallows over an open fire, nibble dew-shiny blackberries or sip your morning cuppa gazing out over sheep-dotted hills. 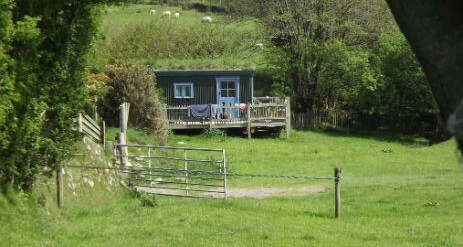 Our yurt set in a 3 acre field next to a babbling stream, at the bottom of the farm where there are lovely views of the surrounding North Devon Countryside. Couples and families can enjoy the peace and tranquillity away from the stresses and strains of everyday life. Walk over the wooden bridge to the yurt, children can play in the stream, add some more stones to the dam or just run around the 3 acre field. 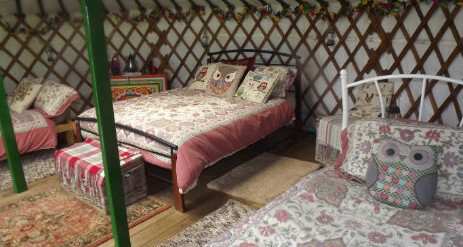 Lit with candles and lamps and heated by a wood burning stove, the yurt has a double bed, a single and a 4ft futon. All bedding is supplied, you just need to bring towels (a torch and wellies are also a good idea. )There is flushing loo close to the yurt too. 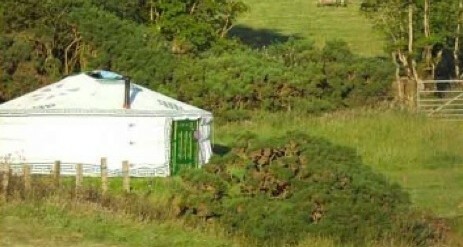 Although let for four the yurt can sleep more comfortably. Extras are charged at a small fee per person per night. You are also welcome to pitch tents by the yurt for a small charge. 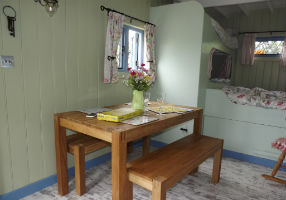 Just outside the yurt is which has a gas hob and grill, pots and pans, cutlery and crockery for six, a bbq, coolbox, outside table and chairs and all you need to cook and eat your meals. Also outside, by the stream is the firepit, a Dutch oven and tripod are also available for cooking on the open fire. Please ask at time of booking. A short walk away at the top of the field, past the chickens from whom you are welcome to collect eggs for your breakfast, are the toilets, showers, fridge freezer, washing machine, tumble drier and hair drier point. 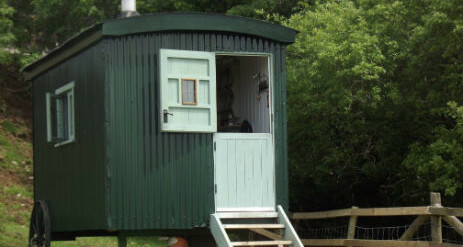 We love our shepherd hut so much we have made another, larger version. 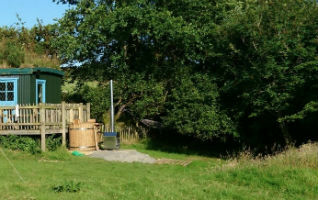 Drovers Hut has a woodfired hot tub set in a secluded spot with lovely views of the surrounding countryside. The Hut has sleeping for 5-6, including a king size bed, single bunks and a trestle bed which pulls out from under the main king size bed. 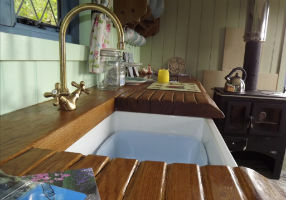 It has a gorgeous country kitchen with Belfast sink, solid oak worktop, two burner gas hob, a table and benches and a wonderful wood burning range stove with oven and hobs above. All the beds have comfy memory foam mattresses, plump pillows and are made up with quality linen. You will have your own private adjacent toilet and shower room too. 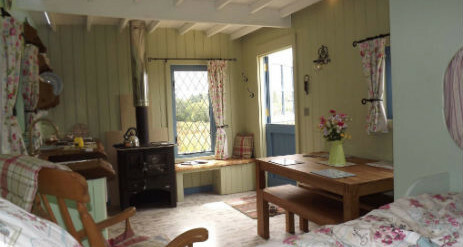 It is fitted out beautifully, in a lovely peaceful corner of the field with wild garden, decking, outdoor inside dh seating and table, fire pit and bbq. The latest glamping experience. 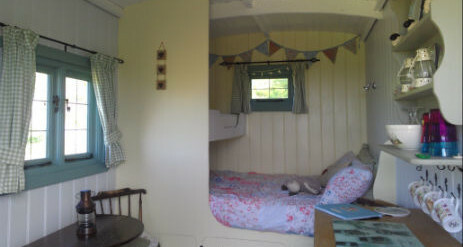 The shepherd hut, built entirely by ourselves, cleverly designed and beautifully decorated with a country chic touch. Thinking of having a party, reunion or family get together? You can hire the yurt and the whole field and facilities for your party for a very reasonable price. Over the years we’ve had many memorable family occasions here – not least a wedding, special birthday parties and reunions. Often our glampers have wistfully commented how perfect they think the farm would be for an event they have planned. It might just be a case of rounding up your family for a jolly weekend of cooking on the campfire and singing a few songs; or perhaps you are bride-to-be wanting something a little different for your hen weekend, or have plans to push the boat out and host of outdoor celebrations for your 40th. If open spaces and country air are top of your list then get in touch. Contact us for more details.